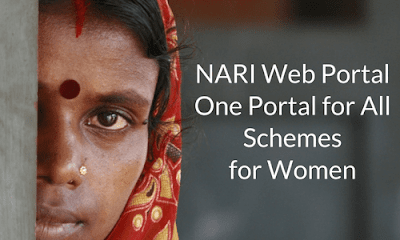 NARI means National Repository of Information for Women. Repository means a place where huge data is stored. So it can be said that this website stores huge data related to government schemes in this portal. This is the only official website since Independence which lists down each and every scheme of government. The portal will provide women citizens with easy access to information on government schemes and initiatives for women. This portal helps to create awareness about central and state government scheme for women like Indira Gandhi National Widow Pension Scheme, old age pension scheme, Maulana Azad medical schemes and many more. For example, many women are not aware of ONE STOP CENTRE is available in 168 districts for women in difficult circumstances. Some women are not aware that PM Awas Yojana gives priority to the registration of homes in the name of women. This portal also counsels us that, which government has launched which scheme and for which purpose. This portal also advises women about legal rights, equality, and women participation. This portal provides information in both languages (Hindi and English). In addition to NARI web portal, the Ministry of Women and Child Development has also launched E-samvad portal. Here ‘E’ refers to electronic and ‘SAMVAD’ means conversation. This portal is a feedback portal, on which NGOs and Civil society can give their feedback, suggestions, put up grievances, share best practices. All inputs will be recorded with ministry and senior officers of the WCD ministry check the inputs like feedback, suggestions for concerned subject areas and appropriately respond to NGOs and Civil society (who give their inputs). This will help in the formulation of effective policies/scheme and measures for the welfare of women and child. These two portals are another step toward Digital India.